We rarely venture over the pond to Ireland, but today’s feature takes us to the heart of Eire – Dublin! Here we meet Analogue Wave, an Electronic duo from Dublin Ireland, comprised of Del Chaney (Vocalist & Songwriter) & Andrew ’Gint’ Sneyd (Producer & Songwriter). 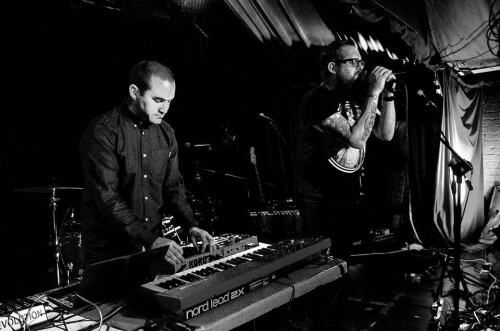 The band’s distinct style has roots in a variety of genres including dub, electronica, synth and rock. But the overriding stylistic feature present in all of their tunes is a satisfying and definitely nostalgic throwback to the 1990s. They emerged on the scene in March 2013 by self-releasing their debut single FINGERS, which met with rave reviews and received national airplay in Ireland and numerous major international stations such as BBC Ulster, 2FM, and 98FM. In June 2013, they followed up with their second single Mezkal & their debut album N.L.G.W.V in September 2013. They’ve been around for a while, so Del and Andrew aren’t new converts to riddim, dub, reggae and electronic buzzes, as shown by the fully formed explorations on their debut album. Sometimes tracks like Devils, Crawl, Mezkal or Narko Dub tell all like some high-grade sonic confession. Borrowing elements of Killing Joke, Lee Perry, Massive Attack and Nine Inch Nails, the album N.L.G.W.V. never strays from something that is pleasantly weird and also doesn’t outstay its welcome. In September 2014, they again self-released their highly anticipated second album Casimir to rave reviews from national & international press, bloggers & online radio stations. Described as a band in love with sound and the possibilities of the digital world, they released three singles from this release – I Feel Hollow, Half Light & the dub reggae instrumental Scatter received praise from key Irish Radio Stations, including 98FM, 2FM & 8Radio Ireland. January 2015 saw the band release a free digital remix album entitled Alterations with remixes of their tracks by other electronic artists like Ummagma, In Violet, Grim Derry & Four Point Zero, along with their own remixes. They have offered us a little something below with an intro by Del Chaney.